"Three Roses on a Tesselated Pavement"
With a rose made of stone, the stone-masons of the Middle-Ages crowned the building as sign of perfection. 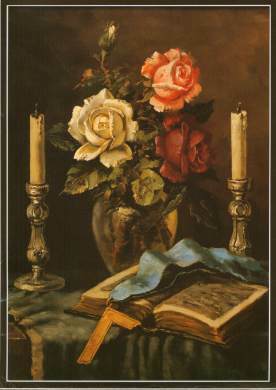 In freemasonry, the rose stands for transformation and for the desire for a higher and perfect life. 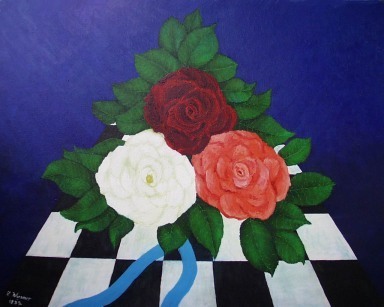 The three roses in the colours of white, pink and red, accompany the freemason from the reception into the brotherhood over the festivals of St. John down to the grave. They are interpreted as light, love, life, and are held togehter by a sky-blue band. The tesselated pavement symbolizes the ups and downs of life (life/death, happiness/misery, pleasure/suffering). The masonic tradition presumes that the foreyard of Solomon's temple was paved with black and white stones. "Rough Ashlar in the Cube"
"The smooth ashlar is the ideal of the stone which fits completely in the building and which has to be formed out of the rough ashlar by hard work. Therefore it is the ideal for someone having made progress in masonic work; someone who has reached the capability of insertion being able to bear the load by self-education." (Lennhoff/Posner, Internationales Freimaurer-Lexikon, Vienna 1932, column 883). 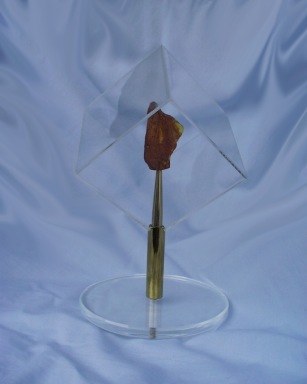 The "rough ashlar" here is enclosed by a transparent cube. This means that the "rough ashlar" as a symbol of the imperfect man is glittering through from the core in spite of all self-education. The way is the destination. During the ritual labour the Worshipful Master and his Senior and Junior Warden are using a gavel formed like a T as a symbolic tool. 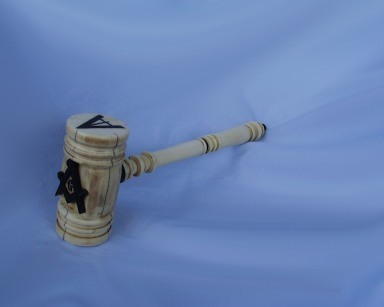 The historic gavel shown here is in the possession of the lodge "Am Rauhen Stein" ("At the Rough Ashlar"). It is made of ivory. At the frontal area, enclosing the letter "G", square and compasses are laid in, and at the knocking areas there are a level and a plumb rule.